Memorable bedtime story targeted for an audience as large as a bull's-eye on the side of a barn. The book is catalogued for January but will be shipped to bookstores in early November for Thanksgiving sales. Few readers will not find some tie between this story of a silenced father-storyteller and Rushdie's death sentence from the Ayatollah Khomeini--but it's a tie not stressed by the author. Perhaps the brightest aspect of the book is its bubbling good humor and witty dialogue, and then its often superb writing: "There was once, in the country of Alifbay, a sad city, the saddest of cities, a city so ruinously sad that it had forgotten its name. It stood by a mournful sea full of glumfish, which were so miserable to eat that they made people belch with melancholy even though the skies were blue." (Alifbay, the glossary here tells us, comes from the Hindustani word for "alphabet.") The story: In the town of K, the Shah of Blah, Rashid Khalifa, a renowned storyteller and the father of Haroun, is deserted by his wife exactly at 11:00 a.m. and loses his power to tell stories. Haroun too loses the power to concentrate longer than 11 minutes. What's more, he insults his father's stories, calling them untrue, but then feels deep guilt for adding to his father's despair. In a P2C2E (a Process Too Complicated To Explain), it seems that most of Rashid's problems are part of the Great Story Sea becoming polluted and the Supplier of Story Water shutting down Rashid's supply. As a Water Genie explains to Haroun: "The gentleman no longer requires the service; has discontinued narrative activities, thrown in the towel, packed it in. He has cancelled his subscription: Hence my presence, for purposes of Disconnection." Which is the typical tumbling Rushdie jumpcat spoken by all and by Miss Blabbermouth, otherwise known as the Princess Batcheat Chattergy (batcheat= "baat-cheet" or chitchat), held prisoner in the Citadel of Chup, a castle built entirely of black ice. 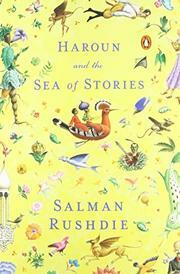 Parted from Rashid, Haroun on his own fights Khattum-Shud, who shuts down stories, and purifies the story waters in the Ocean of the Stream of Stories. A strong winner, though the storyline fades in and out of the prose--a fault that may pass unnoticed if the book's not read in one sitting.